We had the night trip to Bontoc at 8pm. Coda Lines bus' destination is to Sagada via Banaue from Metro Manila. Coincidentally, a blogger friend was also onboard the same bus. 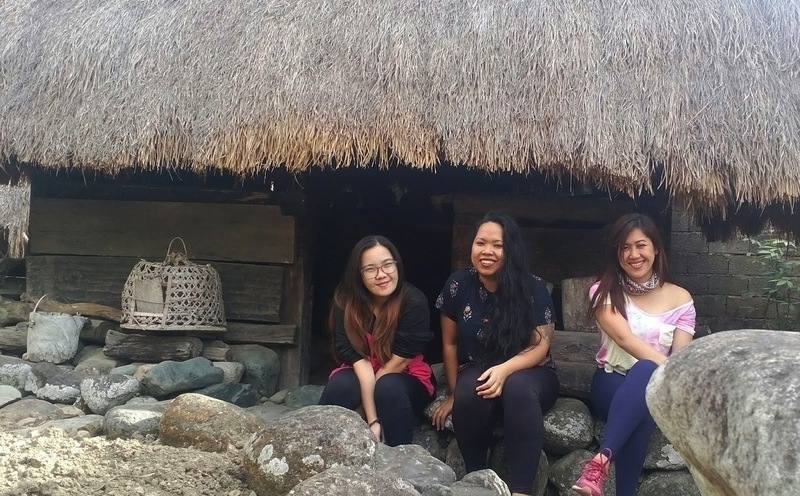 Joane and her 2 friends were bound to Sagada but I also invited them to come and visit Buscalan with us. They were a bit undecided at that moment, so, we just left it to fate. LOL. The 11-hour bus ride was smooth, pretty comfortable, with 4 stopovers, and I was not able to sleep well, of course. We arrived in Bontoc at around 7am, the weather was cold and foggy. We walked up to the bus and jeepney station located at the side of Mountain Province State Polytechnic College, to check with the trip schedules. All bound to Tabuk, the jeepney leaves at 8am and the bus at 9am, then a jeepney bound straight to Buscalan at 2pm. We finally resolved to eat our breakfast at an eatery nearby. Afterwards, we went to Bontoc Museum. Taking pictures inside the museum is prohibited. We were only allowed to take photos or videos outside where the traditional i-bontoc houses stood. Afterwards, we headed to the market to buy some meat and vegetables for us to cook and share. We were all set and done by 9ish and we’re hoping to get on the 9am trip. Unfortunately, the bus already left. So, we didn’t have a choice but to wait for the jeepney ride at 2pm. We waited patiently and excruciatingly for 5 hours, lol. The jeepney was fully-loaded with goods and stuff to be delivered and as passengers, we had to squeeze in ourselves with our backpacks. 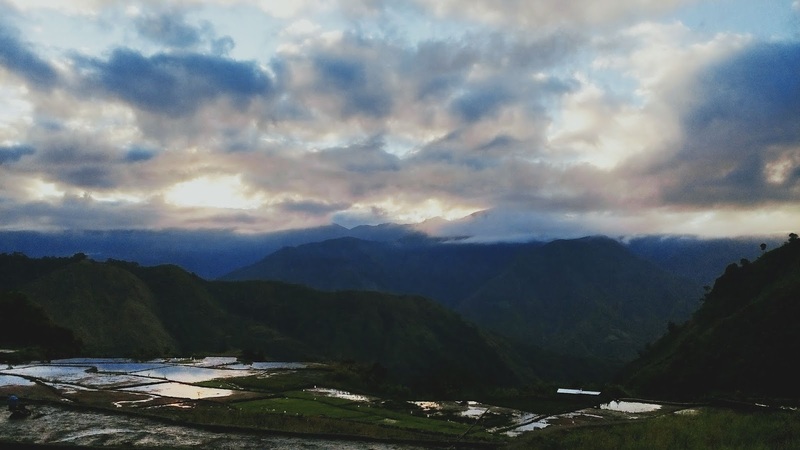 We left Bontoc at around 2:30pm and reached Buscalan exactly at 4:30 pm. Basilia (Kuya Gilbert’s relative) was already waiting for us and after a very short introduction we started the trek up to the village. The trail was new to me, according to Basilia due to a recent landslide the old trail was inaccessible, so they had to clear up a new path way. I must say that the new trail is more challenging! LOL. Naturally, we made several halts to rest and catch our breath. In an hour, we reached the village and we paid for the environmental fee at the registration post. 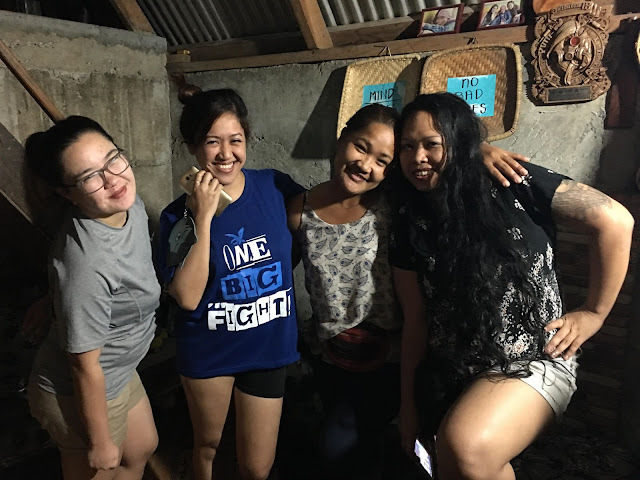 Then, Basilia led us to our homestay, we were welcomed by Kuya Gilbert and ate Belen with hot cups of Kalinga coffee. We were already hungry but we were also exhausted and our legs were sore because of the hike. We rested for a while before preparing our own meal. (We cooked our own meals there but the rice and coffee were offered free.) We had sautéed ‘pechay’ for dinner that night. And after cleaning up, we retired for the evening. The next day, we woke up at 6am to prepare ourselves for the tattoo session. We agreed to get the tattoo designs from Renalyn Palicas, one of Apo Whang Od’s grandnieces. Then later on, get the signature from Apo, for both Mich and Xian. We all did our toiletries and breakfast then Basilia fetched us by 7am and brought us to Renalyn’s hut. We were third in line. We patiently watched and waited, hearing the sounds of tapping. When it was our turn, Mich volunteered to go first and chose to get the sun and moon tattoo on her back. It only took 15-20 minutes for Renalyn to finish the tattoo. Then, Xian was next, she asked for the ‘standing eagle’ tattoo on her right shoulder and the ‘scorpion’ tattoo on her left thigh. For both tattoos, it only lasted for 10-15 minutes, like a flash! 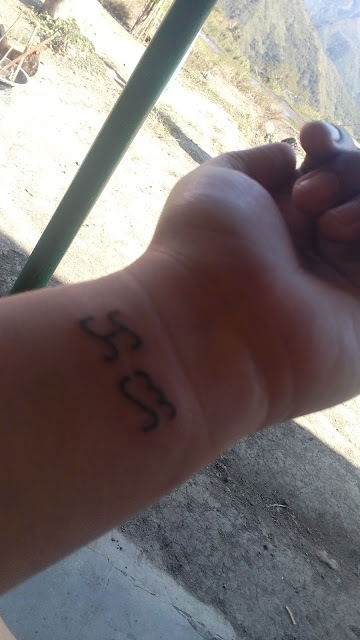 I had my nickname e-ka spelled in Baybayin on my left wrist and it was quickly done in 5 minutes. I loved how gentle and speedy Renalyn was. She works fast but accurate. 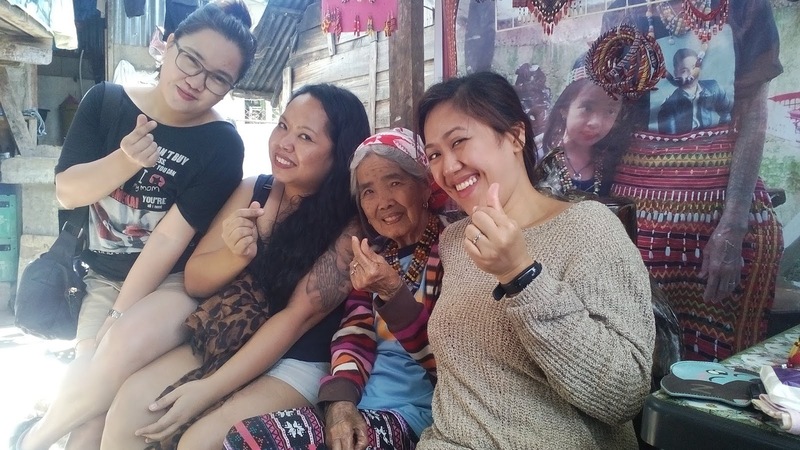 Subsequently, we went to Apo Whang Od’s tattoo station for the signature. However, we were told that she’s a little sick and won’t be able to do sessions in the afternoon. So Basilia accompanied us to their house for a visit. Apo welcomed us with a beautiful smile and allowed us to take photos with her, YAY! Half of the day was pretty much our free time! 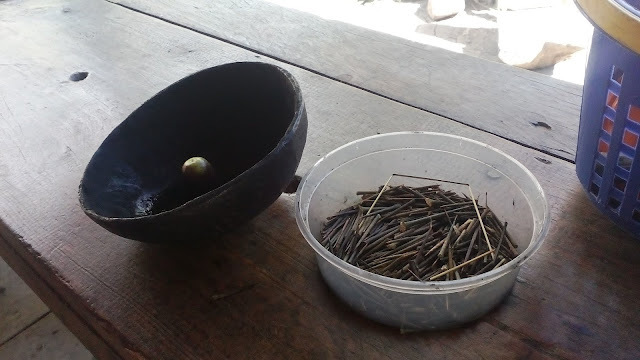 We cooked our food for lunch, we ate, had a chit-chat and idled the rest of the afternoon. We played a little with the local kids and went for a walk in the rice fields. Danced and laughed hard, haha! We decided to have our dinner at a friend’s house, I promised her that! LOL. Selma owns a homestay and the only eatery in the village. When we got there, we were instantly comfy and relaxed at her place and we were served boneless ‘bangus’ over coffee. I also missed feeling Selma’s vibrant and high spirit, you can feel it all over the place, she jokes around and is a very happy person. Unexpectedly, my blogger friend, Joan and her friends were also having their dinner there. It was fate, they made it to Buscalan! LOL. We considered drinking altogether but given that we were staying at different areas in the village, we didn’t. Back atop, before going to sleep, Mich, Xian and I had a few beers and enjoyed the Buscalan vibes amidst the cool and chilly night breeze. We also organized our stuff that evening. The next day, even with leg injuries, we were all ready and set to trek down the mountain. 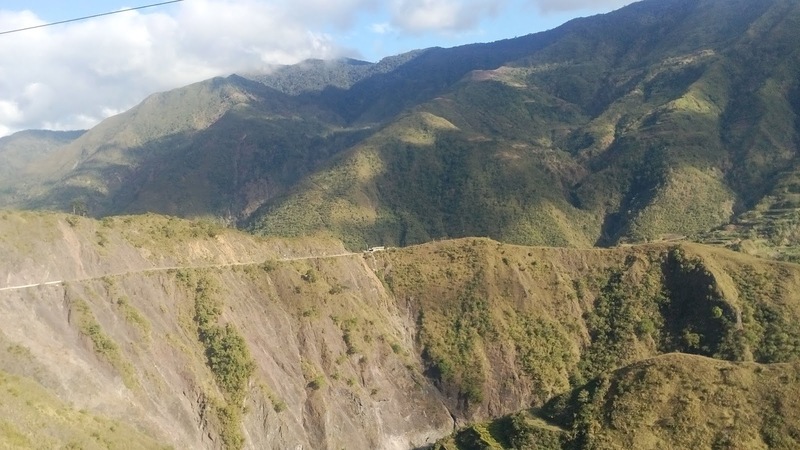 We took the 9am jeepney trip to Bontoc and arrived at our destination at around 11am. We had our brunch at Wingman's Grill, I loved the buffalo wings there! Then, Xian and Mich did a little shopping at the market for 'pasalubong', afterwards we headed to Cable Cafe and waited for our bus ride to Manila by 3pm. I was a bit sad leaving Cordillera but I am sure it won't be the last time I'd be there. This sounds like such a fun trip, and the backpacking would be so enjoyable. Thanks for sharing your travels with us! I love all the pictures! Was the tattoo painful? These pictures make me want to visit this place that I have never heard of before. I do enjoy the breakdown that you did b/c it helps one to know what to expect as far as expenses and you can decide what is necessary and not. Oh my, this look like a really fun trip! And you've got a tattoo, wow! 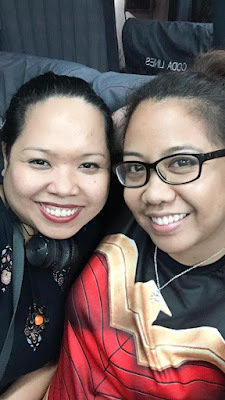 It's funny how you met your blogger friend there, I am always surprised on how small this world is, that we can unexpectedly meet somebody we know from home although we've traveled far away. This is a beautiful place to visit. The view in the photo is stupendous also the trip cost is reasonable. I have never been there but I would love to be there. Such a lovely place. Seems you had a great time. It looks like you had an amazing trip for Chinese New Year. But I don't think I could do an 11 hour bus trip! I converted the cost into UK pounds and it is a cheap trip to take. Always good to know something was even better the next time around. Makes me more interested for sure. I will have to look into taking a trip there. My serpent eagle hand-tapped tattoo was done by the living legend Apo Whang Od of Butbut tribe in Kalinga. They said that it means 'heavenly guidance and protection.' I thought that my tolerance for pain would have been tested again and I was awed that the tattoo was done only in 30 minutes. The thorn tapped on my skin stung like enormous bees but it also felt great, lol. 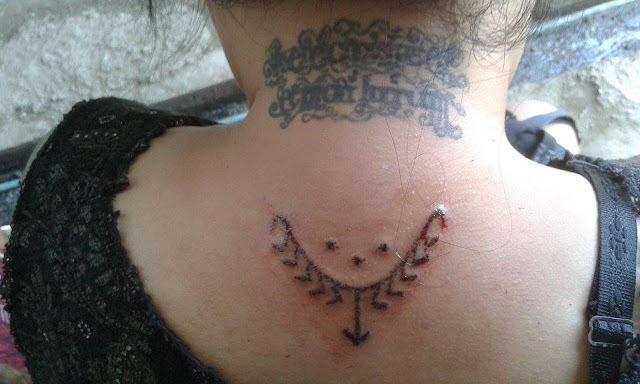 I felt honored and favored by the universe to be tattooed by the last 'mambabatok' of her time. I would definitely try to go back and visit the village soon. 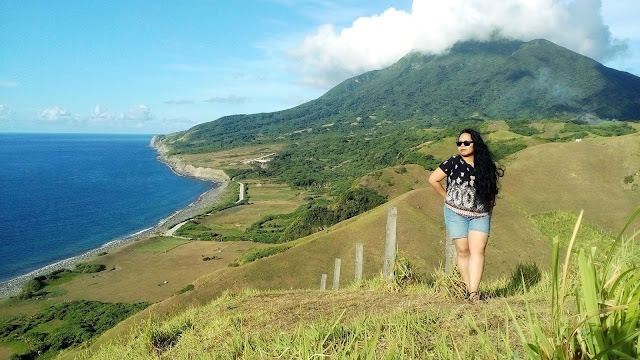 Finally, I laid my eyes on the scenic and beautiful views of Batanes, the northernmost province in the country, home of the indigenous tribe of Ivatans. The simplicity of the island is truly amazing! It was a magical experience like no other. 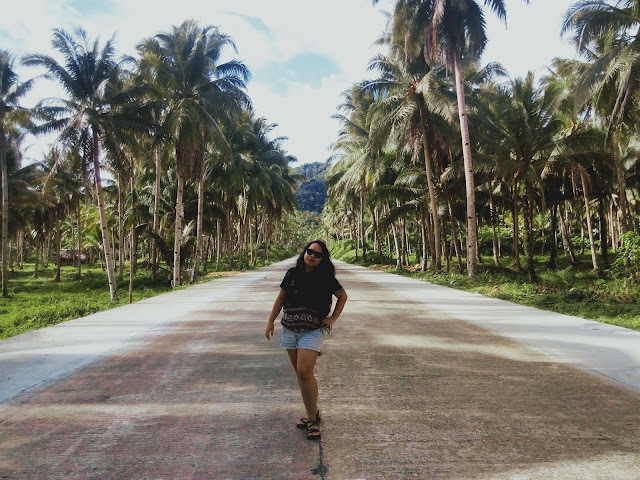 We talked about visiting the islandright after our trip to Batanes 4 months prior. By chance, my friend was able to book a promo flight. We were also preoccupied with our own jobs so we really did not have much time to make a gameplan, lol. However, we did our duties to research about the whatabouts on the web and learned that we had to book an accommodation in advance since it would be hard to find available rooms. We both agreed to stay at Point 303 located a few yards away from Cloud 9.